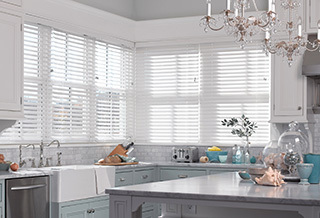 At Budget Blinds of New Caney & Huntsville, we're your local neighborhood experts that truly understand your needs. We're in your neighborhood, we know the local New Caney & Huntsville weather and community, and we’re backed by the #1 provider of blinds, shades, and drapes in North America. Over 25 years of customer satisfaction gives you peace of mind that only comes with choosing the proven leader. We bring the showroom to you in New Caney & Huntsville. We expertly measure your space, install beautiful window treatments, and back it up with the best warranty in the business so you can sit back and relax in the beautiful, New Caney & Huntsville weather and sunshine. We serve to give you the best in window treatments, so you can rest easy knowing your space will be beautified and optimized with window treatments that fit your individual needs. We love being a part of the window covering industry but it's the relationships we build and the satisfaction we bring to the lives of our clients that truly make every day worthwhile! Well hello, and thanks for stopping by to see how Budget Blinds of New Caney, Huntsville and the surrounding areas can elevate your home’s décor and your home’s value. If you’re anywhere near Sam Houston State University, the new Grand Texas Theme Park, or another area of New Caney or Huntsville, our brand of intuitive, personalized design service, combined with the power of the #1 provider of custom window coverings in North America, will transform your home into a dream home. Looking for energy efficient blinds or genuine wooden shutters for that awkward window size? No problem, because at Budget Blinds of New Caney, Huntsville and the surrounding areas our highly trained design consultants put our heart and soul into creating the perfect answer to your window fashion needs. We even bring our entire showroom to you with our FREE in-home design consultation. Isn’t it time you framed your windows and your lifestyle beautifully with custom window treatments from Budget Blinds of New Caney, Huntsville and surrounding areas? We’re active supporters of numerous charities and committed to serving our community. One call does it all, and we do it all for you. Click or call today and see what homeowners in our area are buzzing about! Top notch customer service and quality products. Our blinds and shutters don’t even compare to a big box stores. This was one of the best turn key jobs I have hired out with us moving in to our new home. David came out and measured all the windows and once the products arrived they came back for installations. Completely stress free process! I love my blinds. David is very professional and knowledgeable. It was a seamless experience. I had a great experience from the initial quote to the installation!